“Building Health Literate Societies” was the overarching theme of this year´s European Health Literacy Conference on 14th and 15th of March 2019. The conference was hosted by the University College Dublin and Health Literacy Europe. The programme focused on how to advance research, policy and practice regarding people’s capacity to access, understand, appraise and apply health information to improve their health and quality of life. In addition, the role of health systems was highlighted in the quest of reducing inequality in health within societies. Health literacy is a critical dimension of self-management that is often not properly addressed. As part of COMPAR-EU, one of our PhD students from Nivel, Marieke van der Gaag, presented a poster about her PhD research plans (click on it to see it in full screen mode). 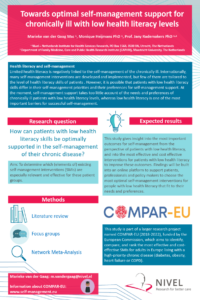 With the title “Towards optimal self-management support for chronically ill with low health literacy levels”, she attracted lots of interested delegates to discuss on how patients with low health literacy skills can be optimally supported in the self-management of their chronic disease. As part of her PhD, she will analyse which (elements of) existing self-management interventions (SMIs) are especially relevant and effective for these patient groups.